2/11/19- SAN FRANCISCO – A man has been breaking into a dental office in South San Francisco and stealing containers of laughing gas. 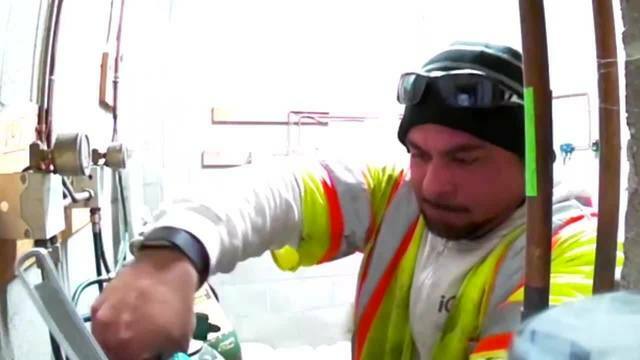 Surveillance video from the most recent incident on Jan. 25 shows the thief in action as he breaks into the building’s storage room and unscrews the nitrous oxide tanks. A dental assistant who works in the building said multiple nitrous oxide thefts have occurred there over the past year. Debora Tatuhahn said the suspect in the video doesn’t look suspicious. He’s wearing a yellow safety vest, goggles, and a beanie. Nitrous oxide is a chemical substance commonly used to sedate patients and can be deadly. She says the thought of someone stealing the chemical and contaminating the tanks is scary. “Opening them up and doing something when you know we are using it for our patients,” Tatuhahn said.